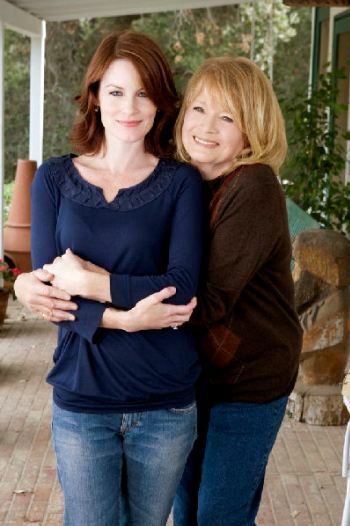 Laura Leighton is bringing back Melrose Place, but first audiences get to treasure the actresses’ return in the Hallmark original film, Mending Fences. daughter (Leighton) moves back home with her own daughter. The quiet of rural life is short for Leighton’s character as a battle is brewing in this small town. veterans such as her character Sydney Andrews making the comeback, along with new faces for Melrose including Ashlee Simpson. spent time at home with the kids while Savant conquered the Desperate Housewives. – it appears the time is now for Laura Leighton. Laura Leighton: Hi Joel, sorry I’m late. I got caught in between napping schedules. SheKnows: Oh, that’s so cute. Laura Leighton: Yeah, I think so. SheKnows: With all that going on in your life, you have to take that time now. Laura Leighton: Yes, I got a little bit going on (laughs). SheKnows: After having your kids and starting a family, what was it that made you want to come back in this way as we have you in a Hallmark movie and the return of Melrose Place? has been the perfect way to keep something while not taking too much time away from my family. SheKnows: What was it about Mending Fences that caught your eye? Laura Leighton: I’ve enjoyed doing movies with Hallmark. I appreciate their value of a good wholesome story. I like the simplicity of it and the humanity of it. SheKnows: Filming a Hallmark movie, many actresses have said that it is a real joy. It is a get away from it all kind of filming environment where they often send you to Montana. SheKnows: That’s nice. You have that with the new Melrose Place too. Laura Leighton: It’s a terrific job. It’s an ensemble cast. It’s right here in town. I couldn’t ask for more. SheKnows: Yeah, that’s true, as an ensemble you don’t have to be on set 12 hours a day. Laura Leighton: Right…it’s not every day. It’s perfect for a mom. but when you look around — it’s new faces. Laura Leighton: It is a little bit surreal. I never could have anticipated finding myself back playing that same character after time had passed. It is sort of surreal and cool. SheKnows: There’s a lot of buzz about Ashlee Simpson’s casting as she pushes into acting. How you had a chance to share scenes with her? SheKnows: Speaking of actresses, you worked with a legend. How was working alongside Angie Dickinson on Mending Fences? with your story, you could write one. Mending Fences airs July 11 at 9 pm on Hallmark and Melrose Place returns to prominence once again on the CW in the fall. Laura’s hubby Doug Savant opens up!